Celestina Mascorro, housekeeper of Martin Knell, takes the witness stand as she is cross-examined by attorney Ricardo "Rick" Salinas during the Monica Melissa Patterson murder trial in the 370th state District Court at the Hidalgo County Courthouse on Monday, Oct. 23, 2017, in Edinburg. 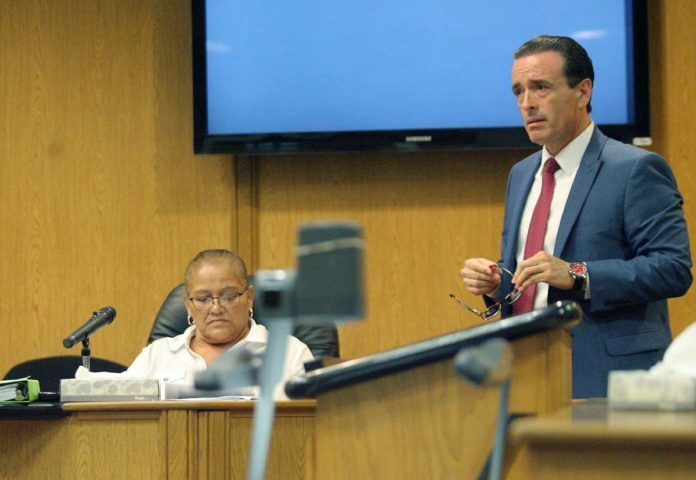 EDINBURG — Celestina Mascorro provided another round of gutsy testimony on Tuesday, engaging the defense with quips and spirited exchanges that at times prompted state District Judge Noe Gonzalez to refocus the witness on her cross-examination. Such was the 21st day in the 370th state District Court, where Monica Melissa Patterson is on trial for theft, misapplication of a fiduciary and capital murder — this stemming from allegations that she helped kill Martin Knell Sr. for his estate. Mascorro, 60, is the caregiver hired by the defendant to care for Knell, 96, in the weeks leading up to his Jan. 28, 2015, death. Defense attorney Ricardo “Rick” Salinas on Tuesday continued to call Mascorro’s credibility into question — a theme not unlike Monday’s cross-examination — particularly with regard to her relationship with Angel Mario Garza. Mascorro’s previous testimony cast Patterson, 50, and Garza, 39, as co-conspirators to the crime, and she told jurors she heard Garza “smother” Knell while Patterson waited outside the victim’s house. Garza, who has also been charged with capital murder, awaits his day in court. Tuesday marked Mascorro’s third day on the stand, and Garza’s cellphone records were central to the defense’s cross-examination of her. Salinas showed jurors a copy of Garza’s cellphone records from Jan. 27, 2015 — the day before Knell’s death — and directed their attention to a call made at 7:19 p.m. from Mascorro to Garza. This contradicted a previous statement from Mascorro about a 7:55 p.m. call she said Garza made to her as being the first time she spoke to him on the evening before Knell’s death. The caregiver said she had no recollection of this earlier call and stated she didn’t have Garza’s number. Mascorro even suggested that it could have been Patterson who placed the call from Knell’s house using the witness’s phone. But Salinas continued to challenge the witness, and at one point asked whether Garza could be on the phone and smothering the victim at the same time — citing multiple calls Garza made around 8:40 a.m., and just minutes apart, the day Knell died. The timeline of events from the morning in question remains unclear, however. A nurse testified last week that she left the house at 8:30 a.m. after completing her weekly visit with Knell and it was not until approximately 9:40 a.m. that Mascorro placed a call to 9-1-1 reporting that Knell was unresponsive. On Friday, Mascorro testified that Patterson and Garza arrived at the residence shortly after the nurse’s departure and told her to wait 30 to 45 minutes before calling 9-1-1 after they left separately. Gonzalez reminded the witness throughout the course of her testimony to listen to the questions being asked of her and to only answer those questions. The defense attorney also spent much of Tuesday trying to cast the caregiver in a suspicious light — a strategy that Patterson’s defense team has employed throughout the five-week trial. “I had to know if I needed a lawyer because I had come forward to tell the truth about what (Patterson) had done,” Mascorro said when asked why she inquired with the Hidalgo County District Attorney’s Office about whether she needed a lawyer. Upon Salinas informing Mascorro that witnesses don’t need legal representation, she replied, “Well, how was I supposed to know,” emphasizing that she had never been a witness to a crime before now. Salinas also pressed Mascorro as to why she continued working for the defendant’s sister — Maricela Garcia — as a caregiver in the wake of Knell’s death. It was Garcia who originally got Mascorro the job with Knell as Mascorro had previously been employed by her. Patterson and Garcia are the daughters of Hector “Tito” Palacios, a former Hidalgo County commissioner and San Juan mayor; and the niece of former Pharr Mayor Leo “Polo” Palacios. Their brother is currently a county court-at-law judge. As Mascorro’s testimony finished Tuesday, the trial hit something of a milestone being among the longest criminal trials in Hidalgo County records, according to District Clerk Laura Hinojosa. The 2013 Smita Chakravarthy capital murder trial, which resulted in a conviction of injury to a child causing bodily injury, lasted 20 days. Chakravarthy appealed the 93rd District Court’s decision, but in February 2017, the 13th Court of Appeals upheld the original ruling. Patterson will be entering her 22nd day on trial Wednesday as the prosecution has yet to rest its case. More witnesses are expected to be called to the stand, including forensic pathologist Dr. Norma Jean Farley.